As regular readers know, I’m a big fan of — and our school and local union is a very active participant in — The Parent Teacher Home Visit Project (see The Best Resources For Learning About Teacher Home Visits). ST PAUL, MN: A mutually empowering method of home visits as a way to connect teachers and families was the focus of the Parent Teacher Home Visit Project’s (PTHVP) annual conference two weeks ago. The organization brought over 300 educators, parents, policy experts and community leaders together in St. Paul, MN in order to connect members of the national network of PTHVP affiliates, who continue to adapt and adopt the model in their diverse locations. Evaluation and research on effective family engagement has been key to the development of the PTHVP model. 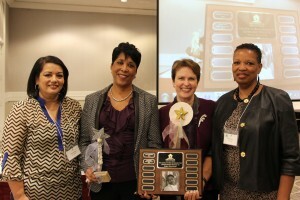 So it was fitting that the organization’s annual Jocelyn Graves Award for Distinguished Service in Public Education went to two academic leaders this year: Karen L. Mapp, a senior lecturer at the Harvard Graduate School of Education, and Anne Henderson, Senior Consultant, Community Organizing and Engagement, Annenberg Institute for School Reform. In addition to works published separately, the two have collaborated on several books on family and community engagement, including the bestseller Beyond the Bake Sale: The Essential Guide to Family-School Partnerships (2007). As researchers, they have evaluated the Parent Teacher Home Visit Project model. As authors, they have included this model of home visits as a best practice. Before the award was presented, Jim Keddy of the California Endowment stood at the podium. He shared his memory of Jocelyn Graves, for whom the award is named. In the late 1990’s, Keddy was the director of the ACT community organizing office, and Graves was a parent looking to forge a more productive relationship with her children’s school. They worked together to form the Parent Teacher Home Visit Project in 1998. A single mother with serious health issues, Graves nevertheless advocated tirelessly for her community, for HIV/AIDS awareness, and for education reform. Jocelyn Graves was a volunteer and trainer for PTHVP until her passing in 2007. Other activities during the conference included over twenty breakout sessions aimed at deepening and strengthening the practice of home visits. Presenters were recruited from the grassroots movement, and the emphasis was on sharing best practices. For example, district leaders from Denver and Reno joined up to share their methods of visioning, planning and data collection systems, and the St. Paul Federation of Teachers led a pre-conference seminar on contract bargaining to include home visits. Performing arts were represented as well. Tish Jones of Minneapolis brought TruArt Speaks, a poetry performance group for youth empowerment, to lead a workshop and a much applauded general session. Comedian Hari Kondabolu led a mirth-filled break-out session about telling stories with authentic voice, and later served on a panel about racial justice. The panel drew from the experience of different organizations and companies who have added racial justice to their mission, including the YWCA, Minnesota Air Pollution Control, Coalition of Schools Educating Boys of Color, and Hackman Consulting. Presenter Yesenia Gonzalez, Honoree Karen Mapp, Honoree Anne Henderson, and Presenter Michele Brooks, Jocelyn Graves Award for Distinguished Service in Public Education presented at the national conference of the Parent Teacher Home Visit Project 2014. More Denver Public School teachers reaching out through home visits is the headline of a recent article in the Denver Post. In the past few years, kindergarten teacher Kori Leaman-Miller can’t think of any student who cried on their first day of school. She hadn’t given it much thought, but officials who are growing home-visit programs in school districts say it may not be accidental. Leaman-Miller is among more than 800 teachers in Denver Public Schools who visit students at home in an effort to reach out with resources, and to create a connection with children and their parents. I’ve written a lot about the Parent-Teacher Home Visit Project, including our school’s — and my — active involvement in it (see The Best Resources For Learning About Teacher Home Visits). I’ve also posted about the U.S Department of Education’s “Parent and Community Engagement Framework,” which they released in April and which talks about home visits (see Department of Education Releases New Parent and Community Engagement Framework). The Parent-Teacher Home Visit Project has just issued a press release talking about the framework and, though it’s a bit late, it does say some useful things about parent engagement and home visits. WASHINGTON, D.C. – An elementary school in crisis that was trained by the Parent Teacher Home Visit Project (PTHVP) has been recognized as a best practice in the U.S. Department of Education’s report “Partners in Education: Dual Capacity Framework for Family Engagement.” The document, meant to guide policy and funding priorities, explains the characteristics of “high-impact” family and community engagement that makes the most difference to student performance. The findings were researched and written by Dr. Karen Mapp, a Harvard University expert on family engagement, and her Harvard colleague Paul Kuttner, a researcher and author focused on community-based school reform. The much-anticipated report has emerged at a time when the practice of home visits is expanding: PTHVP, originally a grass roots organization in Sacramento, has now set up a national office which supports local affiliates in 15 states. The report is also timely for experts in family engagement who are themselves engaged in debate. Books such as “Broken Compass: Parental Involvement with Children’s Education” by Keith Robinson and Angel L. Harris have inspired the media to issue provocative headlines, such as “Parental Involvement Is Overrated” in a New York Times (April 13, 2014). In engagement efforts, the definition of parental involvement varies widely. In some programs, it has a social service bent, where adults are enticed to learn parenting skills with a free dinner, or giveaways of diapers or toys. Another family engagement approach is academic. If parents can be taught classroom subjects like long division, say theorists, they can help their children be more successful. First of all, activities must be relational. Trust and respect must be established between a school and its community before any progress can be made. Barriers to this relationship may include the fact that the school staff is different ethnically and/or culturally from their students’ community, and all parties may have had negative experiences or associations from the past. PTHVP trains participants to identify and reflect upon their previous assumptions. Once they connect with a shared vision, their hopes and dreams for their children, teachers and families have a common language and action plan for the child’s success. Secondly, programs must have “dual capacity building” outcomes. This means that the program raises the competence, and confidence, in everyone involved (teachers, families, students) instead of knowledge being transmitted in only one direction. For example, at PTHVP, evaluations show that home visits result in improved academic performance and positive behavior in children. But the benefits don’t just go one way: teachers and family members experience transformation as well. Parents and guardians report more trust and collaboration with the teacher, which often leads to increased involvement in the school. And they feel better equipped to help their child achieve their goals. For teachers, they report a deeper knowledge of their student’s lives, which helps them differentiate curriculum and make the classroom more relevant. Teachers also report that doing home visits teaches them to leave negative assumptions behind, and see families as essential partners in their mission to teach. Despite the extra effort, teachers credit home visits with more rewards and less burnout. In addition, the researchers find that the highest impact engagement methods are collaborative. Strong, sustainable efforts that stand the test of time are supported by more than one agency. This aspect is also relevant to the PTHVP model. In fact, the project was born as a collaboration between a community organizing group, ACT, the Sacramento City Unified School District (SCUSD), and the local teachers union, CTA. The unusual coalition focused on building trust between teachers and parents, and developed a model that endured and was replicated in districts across the US, each with their own collaboration of local stakeholders. And lastly, family engagement activities must be linked to learning in order to have the highest impact. In the home visit model, the first visit to a family home is an opportunity to make a personal connection, and the second visit is used to discuss how to support the child with academic enrichment. PTHVP has also teamed with Academic Parent Teacher Teams (APTT), pioneered by Maria Paredes and WestEd, and has collected data that shows that when academic parent teacher meetings are preceded by home visits, both attendance and performance rises dramatically. Looking for examples of programs that built trust and increased capacity in families and schools at the same time, the authors lift up the Parent Teacher Home Visit Project (PTHVP) method of home visits in the first of three case studies in the DOE report, which chronicles the turnaround of Stanton Elementary School in Southeast Washington DC. In 2010, Stanton Elementary was in crisis, and the district brought in new administration, teachers, and a myriad of reforms to turn around what was the lowest performing school in the district. Traditional strategies such as improved instruction and a new behavior management system were implemented, along with traditional engagement activities such as bake sales, dances, and parent teacher conferences, which were poorly attended. Things actually got worse: a year later, test scores were down, and suspensions were up. Then in the summer of 2011, a partnership between local Flamboyan Foundation and DC Public Schools brought PTHVP in to train the staff to do home visits. And this, say Stanton teachers and parents, is what made the difference. 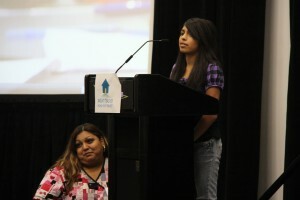 The staff did 450 visits during the 2011–2012 school year, and followed the visits with 30 APTT meetings for families. By the end of the 2012 school year, the report states, Stanton increased their math scores more than 18% and reading scores by more than 9%. And both staff and families reported a transformation in the culture of the school, crediting the relationships established by the visits. Engagement programs across the country, with their diverse goals and strategies, have some self-reflection in store. How close does their program come to the DOE’s recommended framework? Do they build capacity in both families and schools? Do they mutually build trust and respect? And are they linked to learning? How will our answers to the above questions change our ideas of what is effective family engagement? Will it change what we fund and what we do? With time and funds in short supply, schools and districts, as well as parents and communities, must address these questions in light of the research. Teachers make house calls to improve performance is a nice article in Cabinet Report that give an overview of making home visits (plus, it describes what’s happening at our school!). I’m adding it to The Best Resources For Learning About Teacher Home Visits. Teachers find home visits help in the classroom is a good article from the Associated Press. “We’ve figured out a way for people to sit down outside the regular school and have the most important conversation that needs to happen,” said Carrie Rose, executive director of the Parent Teacher Home Visit Project in the California capital. The K-12 program began in 1999 as a faith-based community effort but quickly found support not only in the Sacramento school district but also with local teachers unions. The National Education Association has also endorsed teacher home visits, citing a “critical mass of research evidence” connecting high student achievement with involved parents. A Sacramento TV news station did this great short segment on the Parent-Teacher Home Visit Project. I’m adding it to The Best Resources For Learning About Teacher Home Visits and to The Best Videos On Parent Engagement. Home Visits for Relationships, Relevance, and Results is a thoughtful article in ASCD Educational Leadership. It’s by Julia Zigarelli , Rebecca Nilsen , Trise Moore , and Margery Ginsberg. Excellent Article On Teaching Making Home Visits — & It Features Our School! Home visits help Sacramento families see college path is an extensive article in today’s Sacramento Bee that features the staff and families at our school. It’s a good one, and I’m adding it to The Best Resources For Learning About Teacher Home Visits. I’ve posted a lot about the importance of making home visits to families, pre-school parent involvement, and parent engagement in countries across the globe (you can find those posts here). Now, here’s a story that combines all of those elements. As regular readers know, I’m a big fan of the Parent Teacher Home Visit Project. In a low-income neighborhood in Sacramento, CA, Luther Burbank High School had implemented academic programs such as small learning communities and an International Baccalaureate program in 2006, and students were rising to the challenge of a college preparatory curriculum. But the myriad of circumstances surrounding each child meant that curriculum alone didn’t ensure college enrollments, according to Parent Advisor Elisa Gonzalez. Families, not surprisingly, are a significant factor. Parents may not be supportive in having their teen take college placement tests or fill out applications, and don’t know that there is help for test and application fees. Some refuse to sign financial aid papers, fearing it will trigger attention from immigration or social services authorities. Some families value early marriage and childrearing for their daughters over higher education. And some simply want their son or daughter to immediately get a job to help the family. Could home visits help? Gonzalez had already seen the power of home visits at her school; it was in Sacramento, in fact, that a local community organizing non-profit, ACT (Area Congregations Together), created the original strategy in partnership with the Sacramento City Unified School District and the local teachers’ union. This collaboration formed what became the national organization Parent Teacher Home Visit Project (PTHVP). With assistance from PTHVP and Sacramento City Unified School District’s Title I funding, teachers and guidance counselors went out to the homes of Luther Burbank juniors and seniors who had the credits to apply to college, and broached the topic. The response, at first, was guarded. “I was hesitant, I wasn’t really sure what the home visit was about, because in Junior High Benito hadn’t done so well, and I thought it was about his grades or something,” said Regina Aguillera, mother of senior Benito Aguillera. Benito wasn’t in trouble, his family learned, and the conversation centered on his success in high school and beyond. “I was comfortable, to know we had this communication, the counselors were there to help us and I could call, or come to them at the school, and Benito got the message…he knew I was going to use it. I feel privileged to have had the opportunity to help my child along with the school,” says Mrs. Aguillera, who was one of 14 children and who did not go to college. Benito Aguillera will be a freshman at the University of California, Santa Cruz, in September. His guidance counselor, Emily Catlett, feels that the visits make the difference. “I love to go to my students’ homes, meet grandmothers and grandfathers, talk to kids, see their gardens, hold their pet snakes and gerbils, and see a window into my students’ lives. The home visits are a platform, being welcomed into their home on their terms, and it produces a pathway to the rest of the information. It’s powerful, it’s a magic space we create that really resonates in a way that doesn’t happen at back to school night or meetings at school. It’s real, an authentic opportunity to say “Hey, I’m not lying, you call me,” says Catlett. St. Paul teachers build parent engagement, trust through home visits is a great local newspaper article about teachers making home visits to parents. Since the project’s beginning with just eight trained teachers, to now with more than 250, the St. Paul Federation of Teachers has been instrumental in ensuring the program’s run. Though in addition to their assistance, trainers still go over guidelines and “nonnegotiables” with interested staff. Teacher-home visits are voluntary. If a teacher does decide to participate in the program, they must go with another teacher to both ensure safety and to be a second point of contact for families. Teachers are also required to attend training and after the visit, share their experience. And again, they must be compensated for work done outside of the classroom. This year Faber says he’s encouraged teachers to recognize the importance of diversity. He says parents and the neighborhood take note when visits seem targeted at one type of family, or student. “Then it starts to become not about building relationships, rather the community gets the notion that this is about fixing them,” Faber said. Home Visits Work Better For Health Providers Than Phone Calls — School Parallel? I’ve posted many times here about the importance of schools making home visits to families. Health Quality Partners is all about going there. The program enrolls Medicare patients with at least one chronic illness and one hospitalization in the past year. It then sends a trained nurse to see them every week, or every month, whether they’re healthy or sick. It sounds simple and, in a way, it is. But simple things can be revolutionary. Most care-management systems rely on nurses sitting in call centers, checking up on patients over the phone. That model has mostly been a failure. And while many health systems send a nurse regularly in the weeks or months after a serious hospitalization, few send one regularly to even seemingly healthy patients. This a radical redefinition of the health-care system’s role in the lives of the elderly. It redefines being old and chronically ill as a condition requiring professional medical management. Health Quality Partners’ results have been extraordinary. According to an independent analysis by the consulting firm Mathematica, HQP has reduced hospitalizations by 33 percent and cut Medicare costs by 22 percent. Others in the profession have taken notice. “It’s like they’ve discovered the fountain of youth in Doylestown, Pa.,” marvels Jeffrey Brenner, founder of the Camden Coalition of Healthcare Providers…. Thanks to Alexander Russo for the tip. Today’s Parade Magazine has a feature article on How Latinos Are Changing America. Morales: You ask any Latino parent what is the most important thing and they say education. Yet the Latino [high school] dropout rate is the worst in the country. Why? Alvarado: We need parental involvement. There’s a program in the Denver public schools where the teachers go to the students’ homes to meet the parents. It is being able to sit down, to reach out. The Parent Teacher Home Visit Project has been active in Denver for the past few years. I’m adding this to both The Best Videos On Parent Engagement and to The Best Resources For Learning About Teacher Home Visits. You might also be interested in The Best Examples Of Parent Engagement Through Community Organizing. The headline of this post comes from a nice piece by Jimmy Casas on home visits called My First Home Visit With Larry Leonard. I’m a big supporter of teachers making home visits (see The Best Resources For Learning About Teacher Home Visits). Though I couldn’t make last month’s national home visit conference in Denver, several other staff and parents from our school did attend. I believe the paradigm needs to be shifted in public schools, specifically schools serving the poor. shift to start with first asking if we would step foot through the parents’ front door. The Parent Teacher Home Visit Project makes such a shift possible for teachers. When school districts are under fiscal and accountability pressures, family and community engagement is usually the first thing to go. Given dramatic reductions in funding for public education and given the upcoming election cycle where so much is at stake, these are challenging times for our colleagues across the country. In the midst of this, we had planned for our Sixth National Parent/Teacher Home Visit Project annual gathering in Denver Colorado. We wondered if we should scale back our plans or trust our instincts that we needed to gather now, more than ever! We trusted our instincts as did our supporters – CS Mott Foundation National Education Association, American Federation of Teachers, and PICO National Network- and our many partners schools across thirteen states! Thanks to a coordinated effort where we leveraged and shared resources, we were able to gather together 260 parents, caregivers, community members, educators and administrators for the sixth national parent teacher home visit project. Conference participants heard directly from teachers and parents who lead this effort in their local communities. Melissa Bryant , a veteran teacher, and Katrina Branch, a parent and former student, from Stanton Elementary School in Washington DC spoke about their transformative experiences moving a school that was a “hot mess” to a place where students experienced dramatic increases in test scores. Yvette Juarez, a middle school student from Denver CO, talked about what it means to her to have a teacher visit her home and how that informed her success in school. Whether it was teachers who had been on the verge of quitting, families on the verge of giving up on their local schools, or the community members tired of seeing their children dropout and miss out on opportunities – the testimony of home visiting experiences demonstrated that relational home visits are a key foundation step leading to increased family engagement, better teaching and learning, and increased student academic and social success. The testimony helps us understand the power of the numbers. Here’s what we tallied in our time together. In just the past year, network partners under the Parent/Teacher Home Visit Project trained 2577 teachers. We expanded to 209 participating school sites in 13 states. Together, we conducted 13,391 relational home visits! Given preliminary counts for this coming year, I expect our totals to go even higher next year- even with the challenges before us. We created the opportunity and space to deepen our work. Network partners from around the country paired up and led breakout sessions where we shared data and data collection systems, adaptations of home visiting (in rural communities, for those whom English is a second language, and in secondary schools) and new learning that covered topics as diverse as the impact of trauma on school communities and teaching and learning, the introduction of Academic Parent Teaching Team conferencing in home visit schools and ways to build home visiting into the language of district contracts and policies. We also explored resources and reviewed current national policy and trends regarding family engagement and education reform. We solidified our relationships with each other. We built our personal capacity to better sever students. We strengthened our local projects by sharing and learning. We formally expanded our national network. Mostly, we were inspired by each other and renewed in our commitment to this important work. We know that family and community engagement is an essential component for school and student success. We know that even in the face of difficult times, we must invest in this area for the sake of our students. If you are a school considering home visits as a foundational step in your family and staff engagement and capacity building efforts, please consider joining us next year for our seventh national gathering in California in October of 2013. Better yet, call us now at 916-448-5290 or visit us at our website to see what might be possible. We all began somewhere and a community is waiting for you! Carrie Rose, the extraordinary and tireless Director of the Parent/Teacher Home Visit Project is at the Detroit convention of the American Federation of Teachers. Be it resolved that the AFT work with the nationally recognized Parent/Teacher Home Visit Project (PTHVP); a voluntary but compensated program with values supported by AFT, to educate our locals and spread the implementation of PTHVP home visit model. My support for the Parent/Teacher Home Visit Project is well-known (see The Best Resources For Learning About Teacher Home Visits), so I hope the resolution moves forward!